Please explain. For one thing we don't know with 100% certainty that he's actually dead. Second of all why do you feel the time was wasted because he lost the battle to the Boltons? Why should it be written in stone that he win that battle and what here left you cheated? IMO the story wraps up nicely as his story was always about a man so hell bent and determined to gain the throne that he would not take no for an answer. He gambled on black magic, ignored the weather, other obstacles, was willing to lose everything and he did. Again I simply don't understand the expectations here by some. The expectation is that the stories we follow matter. Not that they get snuffed out in some side story. You may be happy with it, I'm not, I find it a waste of time to have a 5 year arc to basically get rendered irrelevant offscreen. Honestly, it would have been way better if they would have just wiped him out at Blackwater. THAT would have made sense and mattered. Instead they just drag it out for several more seasons and then it just kind of fizzles. When the first question in my head after that is "well what was the point of that then?" ... that's not ideal. If Daenerys is killed later in her quest for the throne, will all that time have been wasted also? If we only followed the narrative of the one who wins in the end, it wouldn't be much of a story. If Dany and her army just ended up fighting some army on Essos and she ended up losing and dying? Absolutely yes, that would render her entire storyline pointless. Last edited by nik-; 06-15-2015 at 09:49 AM. Again you seem to think it fizzled out like you wanted him to go down in some blaze of glory in a LOTR type big battle. The thing is that in real life the bad guys usually do fizzle out. There's nothing Hollywood about relatively quiet demises of Hitler or bin Laden. Also I wouldn't call it a side story seeing his story consumed a large portion of this season. I feel some of you simply get too emotionally attached to characters and of all shows this is not the show to do that. Expecting story lines to wrap up in some chronological or formulaic order is simply not what this show does. The show is about the "Game of Thrones" and that game only as investing in characters or storylines is setting yourself up for disappointment. I feel some of you have got a little too comfortable with the series and forgot what it's all about and what made it refreshing in the first place. From season 1 on we learned that anyone can die at any time with abrupt endings to storylines. That has not changed nor should it. Read this: No one is asking for a Hollywood ending. I really don't know how many times people need to post this before you understand it, but we gotta be on like 5-6 times at this point. This isn't real life, it's entertainment so the laughable comparisons to Hitler and Bin Laden are so irrelevant. It's a TV Show that has 10 hours a year to explain a dozen different storylines. When you have that many storylines and that little time, you don't waste time on dead ends if you're a good storyteller. Part of the problem is that they consumed a large portion of the season on this story and it ended up being pointless. That's not good TV. It's not about emotional attachment (I don't think anyone was rooting for Stannis after he burned his daughter to death) it's about a grand arch of a story that has limited time to be told and they just spent like 30% of the season on something that could have been wrapped up years ago. Basically Stannis storyline was like this. ... what? What is the point of everything after Blackwater if it just ends up at the same result. Do you understand the difference between that complaint and wanting some Disney prince to ride out of the sky on a rainbow blowing us all kisses and how they're not the same? Not only has it not changed, it hasn't evolved at all. Sorry, a show where a bunch of people just fall off and never advance the arc is a bad show. If you're blown away by the same things you were in season one, then good for you. I'm hoping this show has a grander plan than just reinforcing that the good guy doesn't always win. Last edited by nik-; 06-15-2015 at 10:10 AM. What would you say if they end the entire series/books with the White Walkers winning? Imagine they come south and literally destroy everything including Dany and the dragons. Would the entire show have been worthless or pointless? If the writers really want to be responsible for 1000's of suicides, they would do something similar to that. What should the ending be? Dany rides into King's Landing, takes the throne and the whole world shakes hands and celebrates with each other? Nope, that would be amazing. You would have a grand story about the pettiness of man and the myopia on "power" leading to the downfall of everyone. What is the point of everything after Blackwater if it just ends up at the same result. To me it's not always about how it ends and if it's all wrapped up in nice little package of resolution. Stannis went for the brass ring and failed. What was it all for in the end? Nothing. Like Napoleon after Waterloo - exile in Saint Helena til his death. What was all that war and conquest for in the end? Nothing. Count me as fortunate that I didn't have anyone spoiler that stuff for me. That whole episode was shocking to me. You would have a grand story about the pettiness of man and the myopia on "power" leading to the downfall of everyone. I think we're seeing that every season on a smaller more individual scale. Which has already been done over and over on this show. I'm hoping for some evolution, not retreading the same thing with different characters. Location: Hosting a French Salon. What should the ending be? Dany rides into King's Landing, takes the throne and the whole world shakes hands and celebrates with each other? To be fair, Yeah_Baby is the resident hipster, he only likes the Flames ironically. b) that even though Roose Bolton had explicitly told Ramsay of Sansa's importance, once behind closed doors it was forgotten. c) that reek was still reek and even Sansa's appearance wasn't enough to bring Theon back. And that 'c' point set up the scene in the finale. Reek had betrayed Sansa twice. That he would finally find the fortitude to save Sansa now was made more impactful by the earlier events. Yeah, we knew Ramsay is vile and Theon was broken. But in order to set up Theon's redemption we needed to see exactly how far he had fallen. We needed to see him cower when someone he had grown up with was the person in Ramsay's sights. This is Game of Thrones and Martin has been very consistent about saying how he wants to go against the prevailing fantasy tropes. No character is wholly good of wholly evil. The medieval world is vicious and amoral. The good guy doesn't always win or even survive. That some long running characters eventually fall in a non-heroic manner is entirely consistent with what Martin is trying to achieve. Last edited by Yeah_Baby; 06-15-2015 at 10:38 AM. Reason: Trying not to get permabanned. Is there a way to mute posters in individual threads? Its tough to come into the tread and see the same poster or 2 bitching and whining about the same stuff they were bitching and whining about 2-3 weeks ago. That being said, great episode. The first half of the season was a little slower than usual but the 2nd half of the season was fantastic and I'm on the edge of my seat for S6. Once again, the 9 month long break will be agonizing unless we get the 6th book at some time in between (fat chance). The Arya and Cersei scenes from last nights episode were the highlites, but I was fine with how they did pretty much everything. 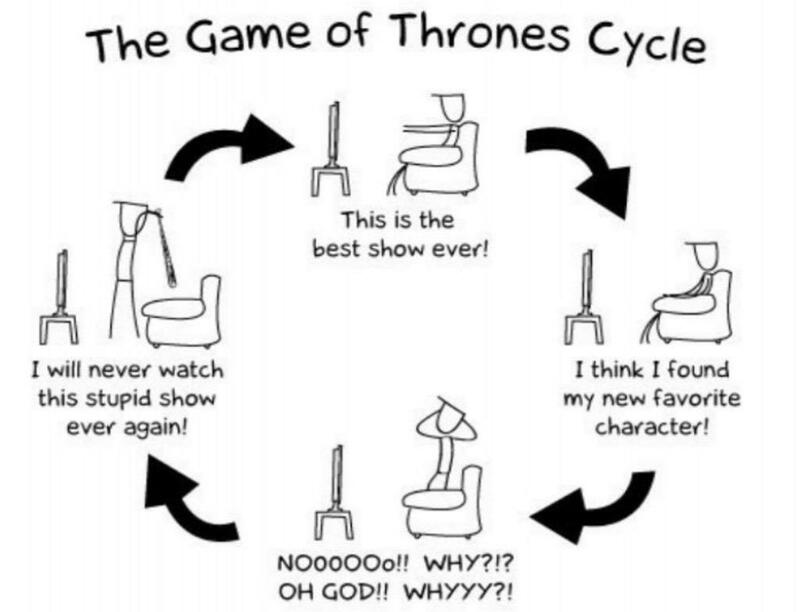 I've mostly enjoyed Game of Thrones for the acting and the production values of the show. Nothing else on TV comes close. I think Martin is great at world building and creating interesting characters but I feel that he fails to deliver when it comes to the plot. He spends so much time building up an event only to chop it off at the knees before it hits the climax. I know some people are going to read that and immediately throw it back in my face suggesting I am upset over so-and-so being killed. I am not mad or upset over characters being killed, nor am I outraged over certain scenes. I've watched it for six seasons so I know what Game of Thrones is all about. However, as I was watching Jon Snow get the Julius Caesar treatment it dawned on me that I've been viewing this show as I would a B-horror flick. To see who is going to be killed off next and in what way. I've said it before but I haven't been shocked by a character's death since Ned's in season one. I've been shocked by the manner in which some characters have met their end but not by their deaths in sense of how it impacts the plot. Jon's death had zero emotional impact on me last night. I sat there and thought, so what? Is that how a major character's death should be received by the viewer/reader? Death has no meaning in this story because Martin wields it like a bulldozer. One of my favorite fantasy authors routinely kills major characters and it's significant both emotionally and in terms of driving the plot forward. With Martin I feel that characters are killed haphazardly. Their deaths fall flat and the plot essentially get reset. None of these stories feel like they're going anywhere. This isn't a rage-quit post. I like the show and will continue to watch it but I am not going to pretend that Martin is a literary genius. Some people are convinced he his but I just don't see it. I think there is zero chance Jon Snow is dead or remains dead. I have a hard time believing they would kill off the only important character at the wall. On the other side I think there is virtually zero chance Stannis is still alive. Brienne would't let him live after he admitted he killed Renly. It isn't Sansa in the books who gets raped. We place that solely at the foot of Benioff and Weiss. Since when did it become okay to talk about the books in this thread? Last edited by EldrickOnIce; 06-15-2015 at 10:41 AM. You're right. I'm sorry. It was an error in judgement. Please don't report me.